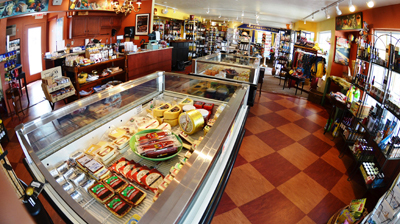 The Door County Deli offers all kinds of tempting goodies! Delicious, ready-to-eat sandwiches from the Grab & Go section, as well as appetizers, dips, cheese platters and lots of additional gourmet products. You can stock up for a picnic or lunch in the park, or get all you need for a great feast! if you are having an event, you can call them and have them prepare some special foods for you! This is another extraordinary shop at Liberty Square in Egg Harbor. Wines from value-priced to complex, big reds are available in this shop. The Door County wineries are all represented here as well as wineries from Australia, New Zealand, Spain, Italy, France, South Africa, Germany, and of course, lots of selections from California. And they’d be happy to pair up your wine with some of the great cheeses and meats they have available – what a great idea for a picnic! You will find specialty foods from around the world. One of the owners, Richard, took us on a tour. You will find a great selection here from sweet ports to dry reds, all in one shop. And, all the wines that are served in their Bistro Bar & Grille at Liberty Square restaurant (under the same roof) are avaialble right here in the shop! So if you try a glass of wine while dining at the Bistro, and you like it, you can take a stroll down to the Door County Deli and purchase a bottle! You will also find a selection of value and premium hard liquors in the “well known essential categories, like vodka, scotch, vermouth and so on. You will also discover wine accessories, like glasses, decanters, wine openers, cheese knives and more. The cheese selection is wonderful, with some hard-to-find cheeses offered by the wheel or by the piece. Cheeses from Wisconsin and Renard’s, of course, are a must! But you will also find cheeses from England, France, and Ireland (there is one fermented in Guinness!). You can find 12 year aged cheddars, Havarti, Le Gruyere and unusual offerings like a “Blueberry White Stilton,” which is also available in a Mango-Ginger and a Lemon White Stilton. The base cheese in this is used for bleu cheese, but it does not have the fermented part of blue cheese – so this is a great dessert cheese. Richard told us that the most popular cheese is Bellavitano – made in Plymouth, Wisconsin – it is an Artisan cheese, made in small, high-quality batches, which makes it very special. To round out the offerings, you can get imported salami and olives, and Parma prosciutto ham. In high season (May – October), you will find dinner entrees and salads that you can select from their cases and bring home to enjoy – with a bottle of your favorite wine, of course. You’ll also enjoy knowing that there is a frozen meat and seafood section that will also have hors d’oeuvres. And in summer, you’ll want to visit their “Grab & Go” case, where you will find gourmet sandwiches, salads and heat and serve entrees too. Wow. Coffees and teas and fresh breads complete the selections. Want to grab a bottle of wine, some cheese, a couple of gourmet sandwiches and head out on bikes for a picnic? Well, step outside and rent a bike after your purchases and off you go! This truly is a one stop shopping experience at Liberty Square! If you are looking for a great gift idea, Door County Deli has pre-made gift baskets, or can custom-make a gift basket for you too! In a romantic mood? Then order up a gift basket before you get here, and take it to your resort or B&B and have that perfect getaway you’ve always dreamed of having! Ask about catering too! Have a great time at Liberty Square! We know you will love the Door County Deli, and will delight in all that it has to offer. And in combination with the rest of Liberty Square, from the wonderful restaurant, The Bistro Bar & Grille at Liberty Square, to the 9+ spectacular shops, Galileo's, and more, you will truly find this a must-go-to destination on your next, and every, trip to Door County. We will be back time and time again! There is plenty of onsite parking and free WiFi throughout the center! And from any shop under the Liberty Square banner, The Shops at Liberty Square, the Door County Delii, the folks here will ship your purchase anywhere! When you do stop in, and you must, please tell Pam, Richard and the staff that DoorCountyNavigator.com sent you! That helps keep this site alive and well for you! Thanks!